In celebration with the opening of the Center for Media Innovation, the Pittsburgh Center for Sports and Media Marketing hosted “The Speed of Live: Why Sports Matter Most to Fans & Brands” featuring two speakers from ESPN and AT&T in front of a standing-room only crowd in the Lawrence Hall Ballroom on Tuesday afternoon. 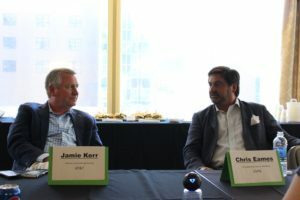 Chris Eames of ESPN and Jamie Kerr of AT&T visited Point Park University Tuesday to speak about the role of sponsorships and media during live athletic events. Photo credit: Hallie Sandor, Point Park News Service. Chris Eames, the vice president of multimedia sales at ESPN, started the presentation by explaining that ESPN and sports exist at the speed of live. No matter how you watch sporting events, whether it is on your smartphone, on your tablet or on your television, you almost always watch it live, which is what makes ESPN unique. Jamie Kerr, the director of corporate sponsorship at AT&T, explained to students about sponsorships at the collegiate level and also explained how those sponsorships are different from those at professional levels. Sponsorship, he explained, is simply when a company pays money to associate with property that people show passion towards. Businesses try to capitalize on this passion. By association, people will start to recognize your brand with what they are passionate about. The two said sponsorships for sports are important because of the large audience size, the passion people feel towards their favorite sports teams and the need for it to be utilized when it’s happening because it’s live. Live sponsorships are also important because viewers can’t just fast-forward through them, they’re going to see the advertisement. AT&T and ESPN are two organizations that have made it possible for the games we watch to become more interactive. 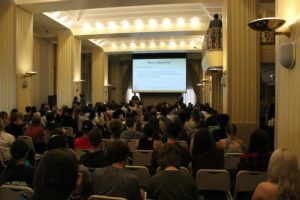 Point Park University students gathered in the Lawrence Hall Ballroom to hear Kerr and Eames speak. Photo credit: Hallie Sandor, Point Park News Service. Collegiate sports are a major focus of advertising right now. With the transformation of collegiate athletics, the opportunity for sponsorships has grown larger. Two years ago, college football playoffs were introduced in order to make the fight for the national title game more competitive. 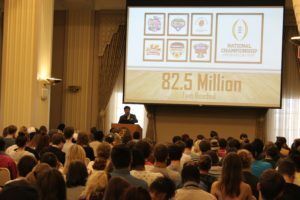 Just last year, the BCS National Championship Game became the second biggest sporting event in the country, reaching 82.5 million fans. Many of these views came from live streaming on mobile devices. Eames and Kerr emphasized that people can remember these sponsorships. After all of their hard work, AT&T was given the third best score of Sponsorship Awareness. When brands like these put in effort, they are given more consideration by viewers. 85 minutes of on screen exposure on the National Championship Game translated to about $41 million for AT&T. Eames spoke about the viewership of the BCS National Championship last year. Photo credit: Hallie Sandor, Point Park News Service. “You have to figure out how to make your brand relevant,” Eames said. The presentation was followed by a question and answer where any other questions students had could be answered. Eames offered advice to students, stressing the importance of patience in the industry. Kerr echoed Eames’ advice and told students to chase their dreams and to network in the process. Ian Brady, freshman mass communication major, explained that although he wasn’t interested in sports, it was still an interesting event to attend. *This story was originally published by The Globe.